Judging by the visitors’ reviews, Palanga hotel truly deserves all 5 stars. popular all year round. And rightly so. We found the location of the hotel just perfect. It stands in a pretty, tranquil setting of pine trees, away from traffic and other noise, which provides incredibly fresh air and keeps you in perfect harmony with nature. 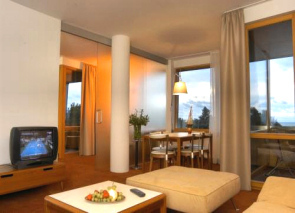 The rooms on the upper floors have spectacular panoramas of the Baltic Sea, which is only some 50 metres away. 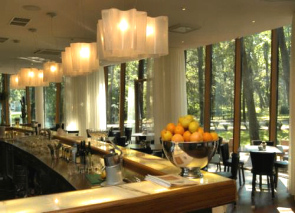 The hotel is not only close to Palanga beach, but is also not far from Palanga Botanical Gardens and the Amber Museum. The town centre which is some 10 minutes away comes alive at night, with a wide selection of restaurants, bars and clubs to choose from. Even though it’s a luxurious top class hotel, it is designed to create a very cosy ambiance, which blends perfectly with the surrounding nature. 70’s style wooden furniture, Brazilian walnut doors, white canopies and light, natural shades resemble the colours of dunes and amber. All the rooms have balconies that overlook the surrounding pine forest. 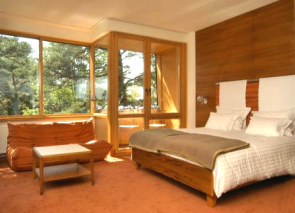 Every morning you will wake up to the idyllic view and a refreshing scent of pines. The rooms are equipped with all modern conveniences: satellite TV, Internet lines, telephones, radios, conditioning systems, mini bars, electronic safes, automated locks and alarm systems. 3-room cottage apartments are popular and very convenient for families with children. 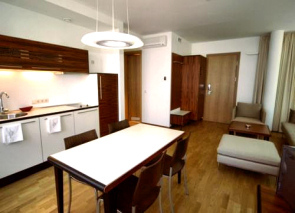 The apartments are equipped with a telephone, satellite TV, a mini-kitchen with dishes, a dishwasher, a washing machine, a dining table, upholstered furniture and a coffee table. All the rooms have balconies, open terraces overlooking the open swimming pool and pine trees. 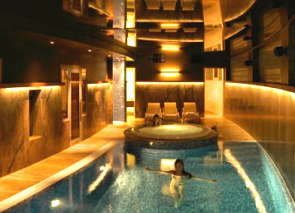 which includes indoor/outdoor swimming pools, steam bath and a sauna, a water jet system combined with natural ingredients like sea salt, seaweed, natural mud and essential oils. They also offer a solarium, training hall and a beauty salon, which provides hairdressers, cosmetologists, manicure and pedicure specialists, massage and aromatherapy services. Other hotel services include room service, meeting/banquet facilities, airport shuttle, babysitting/child services, laundry, dry cleaning, ironing service, barber/beauty shop, breakfast in the room, gift shop, bicycle rental, car rental, tour desk and ticket service. The on-site restaurant carries a marine theme with wavelike chandeliers, sand, stones and exotic plants. Large glass walls and a grand piano add an elegant note. On sunny afternoons, you can enjoy your meal on the open terrace. You will be offered an extensive buffet breakfast. For lunch and dinner they serve European cuisine with a wide choice of seafood and flambé dishes. Click here If you wish to see room rates, book, or read other people’s reviews who stayed at the Palanga Hotel.